In a 2010 study, the Swiss Federal Institute of Technology, Zurich (ETH) investigated the health-promoting attributes of a forward-leaning sitting position. The results confirm increased muscle activity in the abdominal and back areas, which improves oxygen supply to the body – and that in turn has a positive effect on concentration. Tip Ton achieves these ergonomic benefits through a simple forward tilt action and remaining stationary at a 9-degree incline. 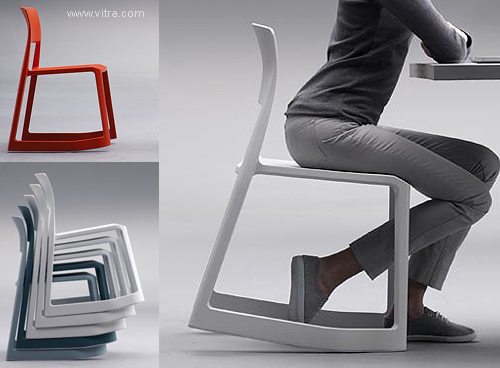 The chair is stackable, made of polypropylene and is manufactured from a single mould. This makes it extremely durable, 100% recyclable and ideal for use in home-office, restaurants, meeting spaces and educational institutions. Very well thought...specially the curve on the edge that helps keeping the leg's natural inclination!! !